The stroller fan can be bendable easily powered by USB charging with adjustable wind speed. Powered by USB, it is compatible with a variety of USB port. It is easy to use can be powered by computer USB power supply, mobile bank and plug charging and car charger. Equipped with thickening net cover, it can not be reached into by baby's hands. To prevent accidental injury. A COOL FAN FOR A COOL KID! -- This unique, original, fashionable, powerful baby stroller fan is perfect for keeping your little one from overheating in the stroller or at home on hot and humid days! Its made from high-quality ABS and silicone material, environmental-friendly, easy to clean and durable to use. Making you MOM or Dad of the year! ADJUSTABLE WIND SPEED -- Control the speed freely by adjusting the step-less knob. Fan does not take up much space, it has sturdy construction, sunflower shape, looks very cute with any stroller! RECHARGEABLE -- With built-in high capacity rechargeable battery (INCLUDED, A $9.99 VALUE), can be used for a long time and you could charge the fan with included USB cable, connecting it to the various USB port energy sources like a computer, laptop, mobile charger and so on, really convenient to use. 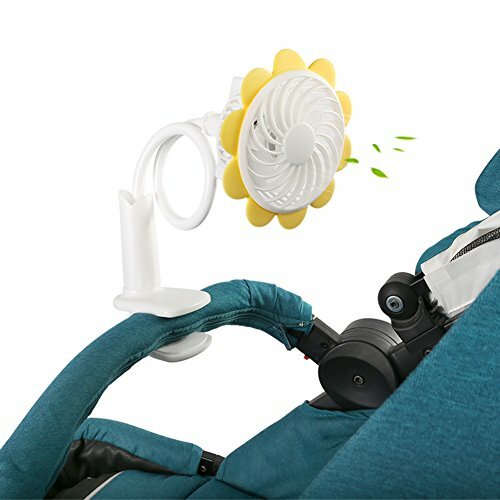 FLEXIBLE NECK AND STURDY CLIP ¨C Whether it's a car seat, a stroller on the move, or a crib at home, the cute sunflower shaped fan could be adjusted 360 degree and employs an adjustable clip to grip onto any surface, allowing the fan to keep your child cool no matter the surface or angle. MULTIPURPOSE -- Samber Baby Fans are perfect for the the beach, pool, picnic or park! It is lightweight, portable and easily fits in your bag of essentials. The only fan you need to keep your infant cool and comfy during hot and humid days! If you have any questions about this product by Samber, contact us by completing and submitting the form below. If you are looking for a specif part number, please include it with your message.